An instructor has many tools that allow them to manage and customize their Turnitin assignment within a Moodle course. 1. Log into Moodle, and select your course. 2. Click the Turnitin assignment you wish to manage. 3. There are 3 tabs: Submission Inbox, Turnitin Tutors, and Turnitin Students. The Submission Inbox contains a Help Link (Optional), the Assignment Details, PeerMark Assignment Settings, and the Student Submission List. 4. Click Need Help with Turnitin? to access a help screen. Select a topic from the I need help with... dropdown. Topics include Classes, Assignments, Submissions, Late Submissions, Managing Students, Similarity and Feedback. After you select a topic, further refine your search by selecting a subtopic from the Just a little more information dropdown. Selections in this list are determined by your main topic selection. After you select your subtopic, help information will appear. If the information is not helpful and you cannot find what you need by reading through other topics, click No, I Need More Help. This will open the Turnitin Support page where you can submit a Support Ticket. 5. If the assignment has multiple parts, tabs across the top enable navigation between the parts. Click the appropriate Assignment Part to view the details of that part of the assignment. The minus/plus sign located to the left of the Assignment Title collapses/expands the Assignment Summary. 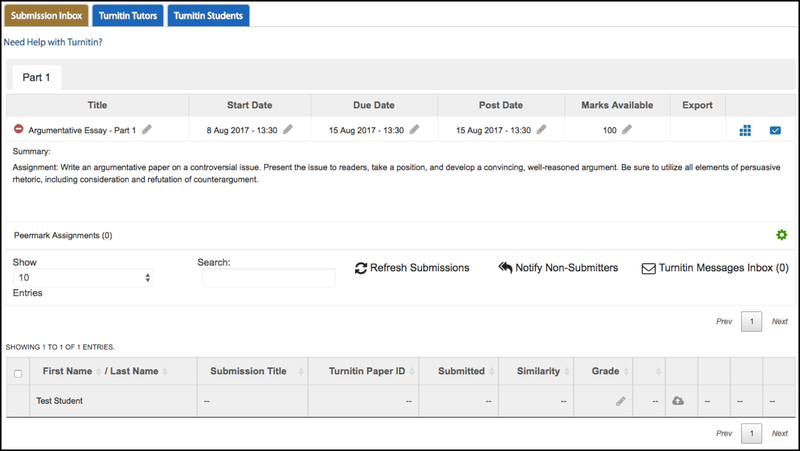 Click the pencil button next to any of the following to edit the field: Assignment Title, Start Date, Due Date, Post Date, and Marks Available. Click the Rubric button (blue squares icon) to launch Rubric Manager and view/edit the rubric/grading form associated to the assignment. NOTE: To learn more about Rubric Manager, consult the Manage Turnitin Rubrics document and the Rubrics Scorecard document. Click the QuickMarks button to launch QuickMark Manager. NOTE: To learn more about QuickMark Management, consult the Turnitin QuickMarks document. The Export field will populate with three bulk download options after at least one student submission: Export to Excel, Export to PDF, and Export to Original Format. Each option is available for individual students in the student submission section of the inbox. To close a download popup, click Close in the upper righthand corner. Export to Excel – Student submission data in an Excel spreadsheet. Export to PDF – A zip file containing pdf copies of student papers. Each pdf contains a title page with student submission digital receipt information at the bottom of the title page. Export to Original Format – A zip file containing copies of the original files submitted by students. click Close in the upper righthand corner of the screen. NOTE: To learn more about PeerMark management, consult the Turnitin Guides PeerMark Overview and PeerMark Assignment Settings. 7. Student submissions appear at the bottom of the Submission Inbox. Student submissions appear in groups of 10. To see more submissions on the page, select the number of entries from the Show dropdown and select the desired number. To search for a specific submission, enter the student's name in the Search field. Click Refresh Submissions to refresh the Student Submission Inbox. The Paper ID is the Turnitin Record for a specific student paper. If Turnitin Support is needed, this number is important for submission tracking. The color-coded Similarity Index estimates the percentage of the student paper that might have been copied from another source. This number is rounded to the nearest whole percent. Click on a specific student Submission Title, Similarity Index, or Grade (edit) to open Feedback Studio. To learn more about Feedback Studio, read Turnitin Guides: Feedback Studio. To submit a paper on behalf of a student, click Upload. To download a copy of the student paper (original file), click Download. To refresh a student submission, click Refresh. To delete a student submission, click Delete. NOTE: To download selected student submission data (Excel format) or papers (pdf or original file), mark the checkboxes next to the desired students, then click the appropriate Export button in the assignment details section of the Submission Inbox.